It’s important to understand the difference between Google Analytics Sessions and Users. Users and Session are related and one builds upon the other. They work together, and they help us understand how often visitors return to the site, and if we are meeting our KPI’s and goals. Let’s start with the simplest item first – a User. In Google Analytics, a User is a unique person who is visiting the site via a computer, tablet, or mobile browser (that accepts a Google Analytics tracking cookie). You (reading my site from your device) are 1 User in Google Analytics. If you open this site in another device, you will be considered another 1 User to Google Analytics, despite actually being a single person using multiple devices. Each new person who comes to a site will get a Google Analytics cookie that tracks them and identifies them. There are advanced methods available to tie a single user to multiple devices but that’s beyond the scope of this article. If a user returns to a site later and has the Google Analytics tracking cookie set from the prior session, they will not be a New User but a Returning User. So users can be either New, or Returning. Depending on our business goals, we may want new Users (SEO, PPC, or others) or we may want Returning Users (blog, support site, or others) and should report accordingly. 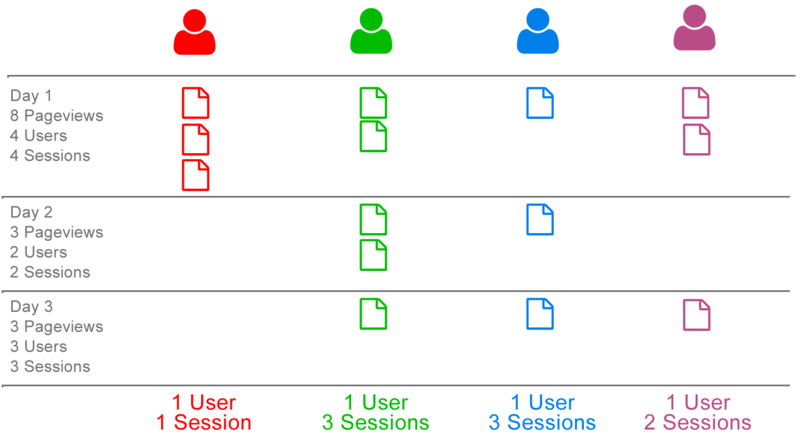 A Session is each instance a User visited your site. Google Analytics will keep sessions active for 30 minutes by default, and then after 30 minutes of inactivity a session is closed automatically. So here is a practical example – if a User first visits a site at 8AM, they will be a New User with 1 session at 8AM. If the same User returns later at 3PM, they are a Returning User with a New Session at 3PM. So this is an example of 1 User with 2 Sessions – because they visited after the 30 minutes timeout. 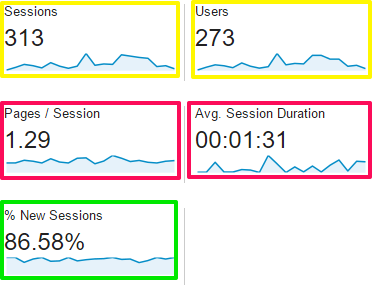 Sessions and Users together show us how often visitors come to our site. This graphic shows us how one actual person can create multiple pageviews, and multiple sessions. Which Is More Important – Sessions or Users? It will depend on your site’s goals. If you serve up ads, news, or social media, you will likely be more concerned with pageviews and sessions. This isn’t to say new Users aren’t important, but that you care more about how frequently users return to your site. If you engage in a PPC campaign for your microsite, you likely care more about Users, since you want to have your marketing exposed to as many new people as possible (and to be sure you aren’t paying to have the same people see the same ads).